People throng Panaji streets to pay last respect to Parrikar Panaji, Mar 18 (PTI) Thousands of people thronged the streets of the state capital Monday to catch a final glimpse of Goa chief minister Manohar Parrikar, who died of a pancreatic ailment, as his mortal remains was brought to the BJP office here for party workers to pay their last respect. His remains would be taken to Kala Academy, around three km from the BJP office, later on Monday, to allow the public pay their tribute to him. A pall of gloom descended on the BJP office and hundreds of Parrikar supporters turned emotional when his mortal remains, wrapped in the tricolour, was brought there. The truck carrying the 63-year-old chief minister's body travelled 5 km from his private residence in Dona Paula to Panaji, as people tried to catch sight of the popular leader, who rose from the small coastal state to become the country's defence minister. 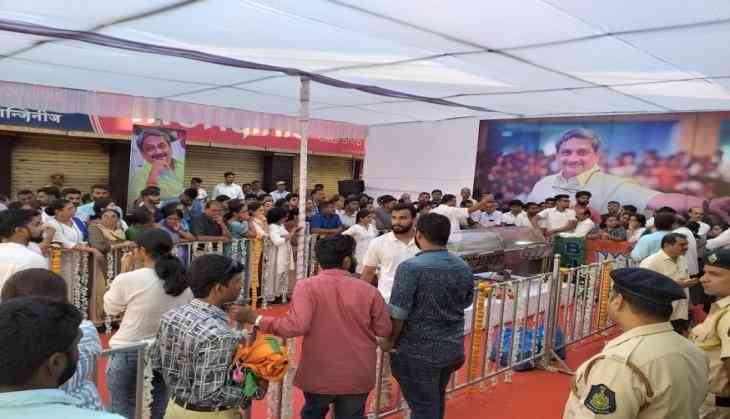 The area around the BJP office in the heart of the capital city was packed with people who arrived there to pay tributes to Parrikar before his final journey. Parrikar, a four-time chief minister, died at his private residence Sunday evening after battling a pancreatic ailment since February last year. The IIT graduate represented Panaji Assembly seat in the state for over two decades. Parrikar's final journey will begin after 4 pm. His last rites will be performed at 5 pm at the Miramar beach here, next to the memorial of Goa's first chief minister Dayanand Bandodkar, who was also cremated there, a state BJP spokesperson said.